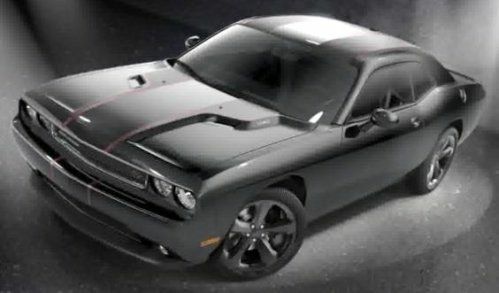 The Chrysler Group has announced that for the 2013 model year, the Dodge Challenger R/T will be available with the optional Blacktop package that provides a dark, sinister look and while the Blacktop edition is available for other Dodge brand models, the Challenger R/T Blacktop is far more than just an appearance package. The 2013 Dodge Challenger R/T Blacktop begins on the outside where buyers can pick from three exterior paint colors - Pitch Black, Granite Crystal or Billet Silver Metallic – with all three choices coming with a matte graphite stripe with red trim running down the middle of the car. Next, the Challenger R/T Blacktop gets unique Gloss Black 20” aluminum wheels with Gloss Black center caps, a Gloss Black grille surround and a Gloss Black exterior fuel door. Inside, the Blacktop models sport the standard dark cloth interior with sport bucket seats up front found in other Challenger R/T models. Luckily, those who want more out of their dark themed 2013 Challenger Blacktop can also opt for the R/T Plus package which adds heated Nappa leather seats in Dark Slate Grey or Radar Red along with added goodies like a 6 speaker Boston Acoustics premium sound system with a 276-Watt amplifier, ParkSense rear park assist, power heated mirrors, EVIC with temperature gauge, a tire pressure monitoring system, vehicle security alarm, and HomeLink universal garage door opener. Whether buyers of the 2013 Challenger R/T Blacktop pick the standard R/T or the R/T Plus, their new Mopar muscle car comes powered by the 5.7L Hemi V8 which packs 375 horsepower and 410lb-ft of torque when mated to the standard Tremec 6-speed manual transmission. There is also an optional 5-speed automatic transmission that drops the power output to 372 horsepower and 400lb-ft of torque but on the plus side, those who pick the automatic transmission get a remote start system with the Blacktop package. Where the 2013 Dodge Challenger R/T Blacktop edition really gets interesting is in the inclusion of the Challenger Super Track Pak. This high performance option group adds a sport tuned steering system, heavy duty brakes with high friction pads and specially tuned antilock braking system sensors that aid in high speed stopping/cornering, a sport suspension system with monotube shock absorbers and a set of Goodyear Eagle F1 Supercar 3-season performance tires. The Super Track Pak also includes a unique version of the Electronic Stability Control system that allows the driver to select a true “full off” mode – which is ideal for time spent on the race track when you do not want the stability control kicking in as you soar through a high speed corner. The Blacktop package for the 2013 Dodge Challenger R/T carries an MSRP of $1,995. The Challenger R/T with the 6-speed manual transmission starts at $29,995, making it the least expensive V8 powered American muscle car on the market today and with the Blacktop package – the standard R/T will set you back right around $31,990 (not including tax, title, etc). Those who want the more luxurious interior appointments can get the Challenger R/T Plus starting at $31,995 so when equipped with the Blacktop package, this higher end model will run you $33,990. Unfortunately, Chrysler hasn’t offered up any official pictures of the 2013 Dodge Challenger R/T Blacktop but we were able to capture the stills available on the right from the company video attached below (click the thumbnails to see them enlarged in our gallery). From what we can see in the video, the new Challenger Blacktop package looks awesome in Pitch Black (and I would expect that many buyers will opt for Pitch Black) but the addition of the Super Track Pak makes this sinister looking Challenger package way more than just an appearance upgrade.